The Melbourne sound scene is a factional, sprawling, many-headed beast. If this sounds like a gripe, it isn’t. Take it as fact posing as opinion. The audience required to sustain such a monster exists, though it consists largely of sound practitioners, and we are prepared to venture far and wide, geographically and aesthetically, to look each head in the mouth and hear the echoes of our own voices shouting down the chasm. As pleasant as it is, Footscray Community Arts Centre, a bluestone basement on the banks of the Maribyrnong River, is not the most accessible venue. It takes a brave aural adventurer to take on the quest. The 5th series of Articulating Space, held every Monday night in March, ran the gamut of sweltering heat to biting cold, and veered sonically from grating tedium to compelling aural assault. This, of course, is one of the series’ main strengths. A diverse and challenging program is essential to the health of any event, and it’s a feature of the many other heads of the Melbourne sound art beast, but Articulating Space distinguishes itself by the context within which work is presented. It’s show-and-tell. Artists present their latest works in a matter of fact way that largely sidesteps or informalises the ‘performance before an audience’ aspect. This trend really became apparent when the out-of-towners performed, becoming exceptions that prove the rule. Jim Denley (Sydney/Brussels), KK Null (Japan) and even the pairing of Philip Samartzis and Casey Rice (Melbourne/US) for the first (and last?) time, were compelling more for performance reasons than necessarily sonic ones. Meanwhile, among the locals, there was an almost total removal of the entertainment factor; the performances were more akin to demonstrations, or workshops. That’s not to say that the issue of performance was not addressed at all—c’mon, this is still the performing arts, folks! In particular, performances by followers of the extended techniques religion (Jim Denley, Anthony Pateras, Tim O’Dwyer etc) obviously had to address performance. Denley was most interesting, perhaps because he chose to perform from the centre of the seated audience in what seemed an attempt to direct attention away from himself as performer. However, watching Denley’s bodily gestural theatre is as crucial as the sound. In contrast, Thembi Soddell also performed within the audience, but as transparent sampler anti-performer. She presented a compelling combination of shy quietcore and abrupt volume/intensity cuts that hinted at a perverse grunge aesthetic. There was the usual predominance of laptop/mixing desk performances, which seem to naturally raise the question of performance. The laptop performance argument is getting somewhat boring, and increasingly irrelevant, but I have to say the ‘3 amigos of laptop’—Steve Adam, Ross Bencina and Tim Kreger were exceptional because they gave a real sense of 3 musicians/artists playing as an ensemble. This was also largely evident in the sound they produced, as the usual range of smirks and grimaces in the glow of the monitor screens gave little away. Showing even fewer facial tics, Tim Pledger and Dave Nelson, ostensibly twiddling knobs on a mixing desk, presented a focussed piece of restrained discord and harmony interplay, and tonal tension. But back to the show-and-tell where Klunk (Rod Cooper) stood out. Prefacing his performance with an explanation of how he came to design and build his continuous bowing instruments he methodically moved through the instruments’ koto/hurdy-gurdy-like plucking and dronal effects, offering a mesmerising sonic insight into his work. The show-and-tell format also becomes interesting when familiar performers present, allowing analysis of the micro developments in an artist’s oeuvre. Tim Catlin continued his explorations of the sonic range of the electric guitar, presenting the instrument in perhaps the most fragile and delicate fashion he has to date. Natasha Anderson has extended her wind instrument fetish so far that the only remnant of an instrument was a hand operated air pump! 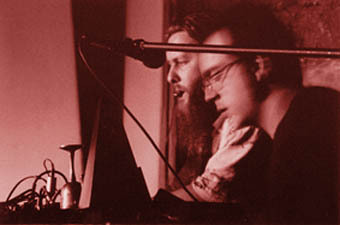 Robin Fox and Will Guthrie stretched the ‘Fox Paradox.’ Fox, an extremely knowledgeable analog synthesis historian, performs using software processing that requires audio input to process, in this case Guthrie’s percussive tinkering. Fundamentally this is the opposite of synthesis, which generates output from a purely electronic starting point. Ultimately, deliberately dismissing any pretence toward entertainment means audiences need to consider not whether they enjoyed the event, but rather whether they learnt or discovered anything. Articulating Space consistently provided fertile opportunities for sonic discovery. While Anthony Pateras takes a well-deserved break from organising the series, and its return to Footscray remains in doubt, it would be a shame if this type of sound art event disappears from the scene.